A Parenting Life: That's a lot of cars! 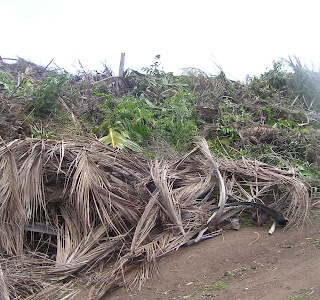 In the aftermaths of cyclone Helen the other week the local rubbish deposit centre (aka the dump), reported over 3000 cars on one day, all with green waste. This is an amazing number given the overall population. I have heard it reported that over 800 trees fell (literally) victim to the cyclonic winds. Personally I have witnessed a huge number of trees down but that number is huge so I am a bit dubious about the truth to that number. I think perhaps someone may have missed a few, though my sources assure me it is correct. Anyways, we were one of the 3000 people that ventured out to dispose of plant matter on that day. For a trip to the dump it was pretty amazing and the piles of rubbish that were being created were unlike anything I have seen before. Lucky for me I had my camera on hand. While it is no prize winning shot, I thought I would include it anyway!